Forum Home - > Pow Wow Crafts > Beadwork Design Elements Own Design or Copy? As an interesting note , my Grandmother taught linguistics at O.U. in Norman Oklahoma. She told the story that her German Foreign Exchange students picked up the Cheyenne language much easier than any of the others , including Cheyennes. I think it's due to Cheyenne being a very guttural language and some of the sounds are difficult.The German language is similar and has some similar sounds. My copy of this book is an original 1940's BIA - Division of Education edition. It was in the books my mom had from back when she taught for the BIA. The page numbers don't match. But, there are pipe bag designs in there. I learned to design by studying beadwork. I looked at the designs around me, at family pieces, a museum pieces and photographs. I talked with other artists and learned about at how they used shape and color. Then I beaded and beaded. Look at some modern beadwork. Keeping Heart on Pine Ridge, Victor Glover; Native Voices: Summertown, TN, 2004. Rez Life, David Treuer; Atlantic Monthly Press:New York, 2012. The Death of Raymond Yellow Thunder: And Other True Stories from the Nebraska-Pine Ridge Border Towns, Stew Magnusen; Texas Tech University Press: Lubbock, TX, 2013. Bead on an Anthill: A Lakota Childhood, Delphine Red Shirt; Bison Books: Lincoln, NE, 1999. Turtle Lung Woman's Granddaughter, Delphine Red Shirt; Bison Books: Lincoln, NE, 2003. Standing in the Light: A Lakota Way of Seeing, Severt Young Bear, R D. Theisz; University of Nebraska Press: Lincoln, NE, 1996. Custer Died for Your Sins: An Indian Manifesto, Vine Deloria, University of Oklahoma Press, 1969. I simply do not know. There should samples of Cheyenne to be found on the internet which I can listen to. Found some samples. Some words I can pronounce but there are other words and sounds which are difficult. The same is with Lakhota. Got a book Lakhotiya Woglaka Po! (Level 1)and CD. Pictures with the words which reprsent was is shown. Very similar what I found online about Cheyenne. At my age it has become painstaking to learn a new language. Will only go slow ahead. If my wife made me a really nice buckskin shirt and I decided to wear it into battle, then added a few "lucky" trinkets or designs on it , does that make it sacred ? Not to diminish the value as some warriors would have their shirts blessed by a Holy man , but in the end it's just a shirt ! Something I do not catch or have it wrong. Isn't there a difference between a buckskin shirt and warrior selected to be a war shirt wearer or is that a question of the tribe teh warriro belongs? Headdresses were earned and only worn by Chiefs and great warriors , but as all things , that practice has diminished as well.Now it seems that anyone who can collect enough feathers can build and wear a headdress. I see lots of very young guys dancing Tradish , wearing headdresses, and knowing in my heart that they didn't "earn" them and they're too new to have been passed down. Just an observation and a personal opinion ! Seufz. Must have something to do with the modern times. When watch the young folks, I feel not so old as I am and yet I get the impression that I migth become an dinosaur. Pipe bags are not sacred. Only some pipes are ! At least among my people. I have a pipe. Is it sacred ? Probably not , but if I use it to pray , does that make it sacred ? Good question , to me it's just my pipe. I forgot, somewhere I read your part Cheyenne and if I remember correctly Arapaho. You make me smile. Geometric designs are just designs. Like I said before , there are only so many colors and so many ways to bead a mountain or tipi or whatever ! Some families have personal designs that they don't want copied , but again , if you see the design and change a color or add another row of beads to it , is it still their design ? Let common sense prevail. If you believe it to be wrong , don't do it ! I am NOT a Holy man , nor do I consider myself an Elder , just an old guy ! 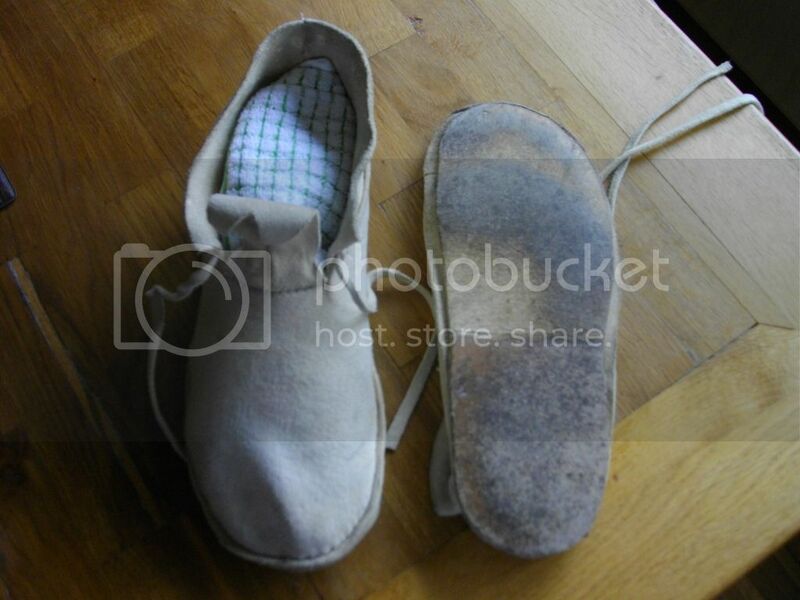 I AM a Northern Traditional Dancer and builder of traditional regalia and moccasins. I know the traditions that my Elders and Mentors have allowed me ! I am not part of you culture yet you have influenced my world a lot even it is neglected and I can't help it, I still will like geometrical beadwork. And I can not tell you in rational argues why geometrical beadwork. Floral beadwork ist great but I have no calling to it. Do not how to express that better. If asked, I'll try to give an rational answer but that is the same as being asked why I like to shoot my flint lock. Every year we have the same political fight if fire arms in privat posession should be totally prohibited. The question always is why do you need to shoot. For the same reason, I need to play table tennes as long as my feet worked. Bottom wardancer, I am going to like you. Thanks for your time to teach me a little bit. Designs around me is a little bit difficult if not to say impossible. Looks like "The impossible gets done at once, but miracles take a bit longer." Thank you very much. I know that what I read is lets say a little bit outdated or to much focused on the past. But without past, there is no future. Both Lists help. I am going to like you like Wardancer for your posts and that very much. I have learned new ways of looking on you and your people. We live indeed in 2017 not in 1917 or 1817. And I will never fully understand because it can not be learned through internet and reading books. But may be, I can learn a little bit more. I think you're trying to extend a leadership role in pre-reservation Lakota society to all plains nations. "Shirt-wearers" are leaders among the Lakota. They had a shirt of a particular design and construction as a badge of office. Don't assume other tribes used the same badges of office or had the same political structures. Some shirts are society regalia, some are not. Some shirts are religious apparel, like Ghost Dance shirts, others are not. Some were worn for war, some just to keep warm. If you look at old pictures, ignoring the shirts which the photographers owned and used to make sure their subjects were dressed like a white audience expected Indians to dress, there are many many shirts. I've sent pictures of more Lakota men in shirt than there were shirt wearers. In modern usage, buckskin shirts are seldom part of regular dance regalia -- kind of restrictive, hot and hard to keep clean. At larger powwows you might see older gentlemen, dignitaries of various sorts, wearing a shirt, leggings and headdresses. Artists still make shirts. They are a beautiful form. Pipe bags are not sacred, at least among my people. They are a fairly common form. I've made more than a few over the years. They are nice gift pieces. They get a good price in galleries. Many Indian people object to the sale of pipes, not because the pipe in question is necessarily sacred. But such sales are part of the larger appropriation and abuse of Native spiritual ways. Last edited by OLChemist; 02-20-2017 at 06:20 AM..
By the way, the prayer at the end of your signature line is the Serenity prayer by Reinhold Niebuhr. In the states, it is used by twelve step programs like Alcoholics Anonymous or Narcotics Anonymous. Yes, I thought of the Lakota. If there are different views you need to know all views or does that not migth give reaosn for dispute? Some shirts are society regalia, some are not. Some shirts are religious apparel, like Ghost Dance shirts, others are not. Some were worn for war, some just to keep warm. You make me curious how that would feel to wear such shirt, leggins, breechclout in comparison of the clothing from the medieval times over here. (The last much better than I thought and the linen shirts would be great wear today. I have tried out at the Center for experimental medieval times. (Historians, Archeologists and interested People) Well tailored more to modern times linen shirts would be a good thing. Else you look funny to other people as everyday wear. The belt for the breechclout should tied securely, else would or might be unfortunately. If you look at old pictures, ignoring the shirts which the photographers owned and used to make sure their subjects were dressed like a white audience expected Indians to dress, there are many many shirts. I've sent pictures of more Lakota men in shirt than there were shirt wearers. I know of that palce: Photographs of Native American Indians. American Indian Photographs. I found Native American (Plains Indian) War Shirts (War Shirt) and Native American Nations Trading Post Wholesale and Retail Silver Jewelry and Artifacts for example. Than selling and buying Indian art from Indians may always been difficult if seen of appropriation and abuse of spirituality. Buying from Germany despite of internet is at least not as easy as it seems. If ordering in the US as an individual, customs in Germany is sometimes quite spiteful. Thanks you; i know four more artists. That one I found by chance: Plains Indian Bows - Home. A Beadwork thread without pictures seems not best thing to be. I started beading before I asked here. Now I am reconsidering what I will do or how I shall or can do. Yet my way learning to bead is limited as your way to learn is not possible in Germany. It that would be possible to me in South Dakota I can not answer. Beading is a good way to find internal piece may be serenity and get away from much to fast normal day life. I wonder why you beaded the moc crooked ? At least that's the way it looks in the pic. I am going the hard way of try and error and learning what you can all do wrong. And I have some difficulties with my eyes. I am four eyed but for beading I need to the the glasses of. I was told, that I have 80% eyesight left. The pattern was intended to be centered to the toe and that is not along the center of the upper. I simply go it wrong and was late to see that that it went wrong but did not want to undue the work. At least it reminds me, that I make errors. The triangles are equally not as I wished them to be. I wanted them to be isosceles but that is not easily achieved if at all. The beads are Nr.10 Czech seed beads from Preciosa. The rows may be stitched to narrow too. Here's a pair I just did for my wife. And the link goes to the finished product. Last edited by wardancer; 02-27-2017 at 11:52 AM.. I wasn't "nitpicking" your work. The designs look fine , just off center. Thought maybe you had a reason. I use size 11 czech beads , but that's just personal preference. 7 on a row , Cheyenne style lazy stich. It lays flatter. I wasn't "nitpicking" your work. The designs look fine , just off center. Thought maybe you had a reason. I use size 11 czech beads , but that's just personal preference. 7 on a row , Cheyenne style lazy stitch. It lays flatter. I took and take your hint not as nitpicking. Just fine with me to get hints. I learn. Your mocs look very fine to my eyes. My spacing of the vertical rows is to narrow. But how nuch space should I give? And on the second line, you have not a one to one lane match if I see it rigth, where the curve is sharp. I took ten beads lazy stitch. Seems to be to many beads. 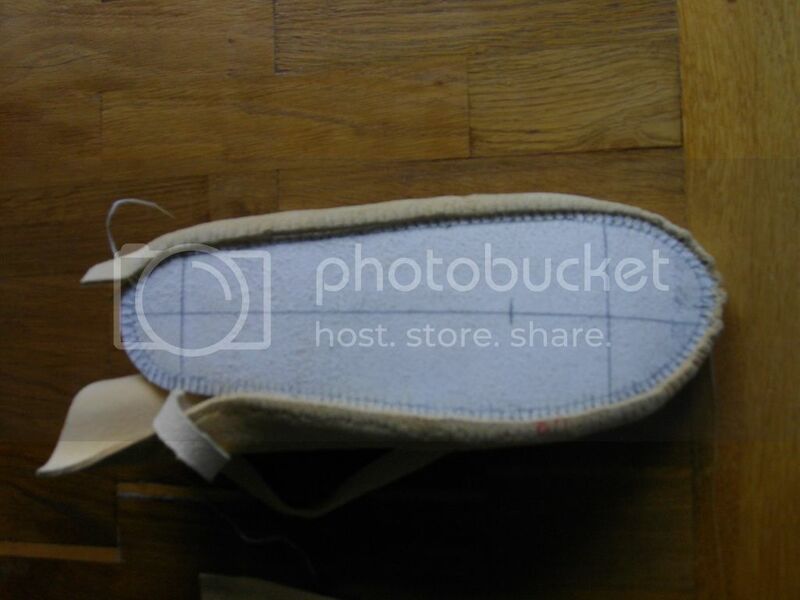 Sewing the sole to the upper or the upper to the sole there I assume I likewise have something missing to get it good. 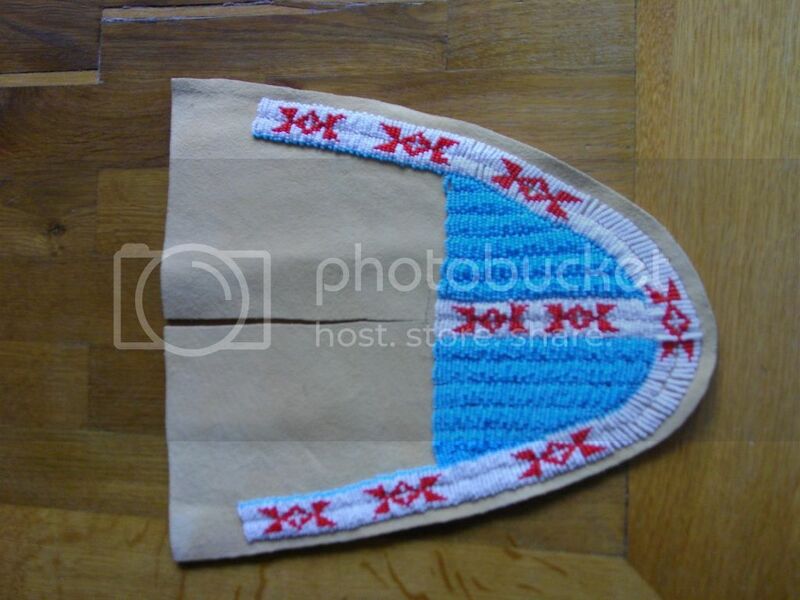 I got a booklet from Crazy Crow name Native American Mocassins, A craft Manual. Looks easier than it is to follow the instructions. You need to work consistently and that requires do, loo´k, think, do, look, think, do look think, until it works. Old army rule says, vormachen, nachmachen, drillmäßiges üben. show how to do, imitate, drill practise. But this seems more of the art by try and error or may be learning by pain. Your mocs look very fine to my eyes.Thank you. My spacing of the vertical rows is to narrow. But how nuch space should I give? I like 7 beads. I've seen fewer and I've seen more. That is why they call it "lazy stitch" ! How lazy are you ? lolAnd on the second line, you have not a one to one lane match if I see it right, where the curve is sharp.There is no way you can have a "lane to lane match" as the amount of space on the second lane is smaller/shorter , and rounding the corner somewhat smoothly demands different spacing. The trick is doing both without it being overly noticeable. I took ten beads lazy stitch. Seems to be to many beads.personal preference , I use an odd number (so I have a center)and seven works for me. Trial and error ! Sewing the sole to the upper or the upper to the sole there I assume I likewise have something missing to get it good.Don't pull the leather tight as you sew the top to the sole. If you do , you'll end up with "elf shoes" ! LOL The toes will curl. I got a booklet from Crazy Crow name Native American Moccasins, A craft Manual. I've not read it but my Grandmother was a moc maker. I try to live up to her example , but I am seriously lacking in her talentLooks easier than it is to follow the instructions. You need to work consistently and that requires do, loo´k, think, do, look, think, do look think, until it works.It takes practice and patience. I've made more than a few pair and I still make mistakes ! About the only pain I get is stabbing my fingers with needles ! You can browse back in the "F"Word thread and see more of my mocs as well as other crafts members here have done. Last edited by wardancer; 02-27-2017 at 10:00 PM..
Part of what you have to remember when beading moccs is that the human foot isn't flat. You need to adjust the placement of the design. If you've used one the patterns in many of those craft manuals, the centerline in those doesn't necessarily correspond to the centerline on the foot. You almost never align the design down the pattern centerline. If you look closely at Wardancer's uppers you'll see the slit for the tongue and the centerline of the beadwork is canted slightly inward. When sewn to sole and turned into a 3D object with a real foot inside the beadwork will run down the centerline of her foot. Some folks feet are less symmetrical than others. 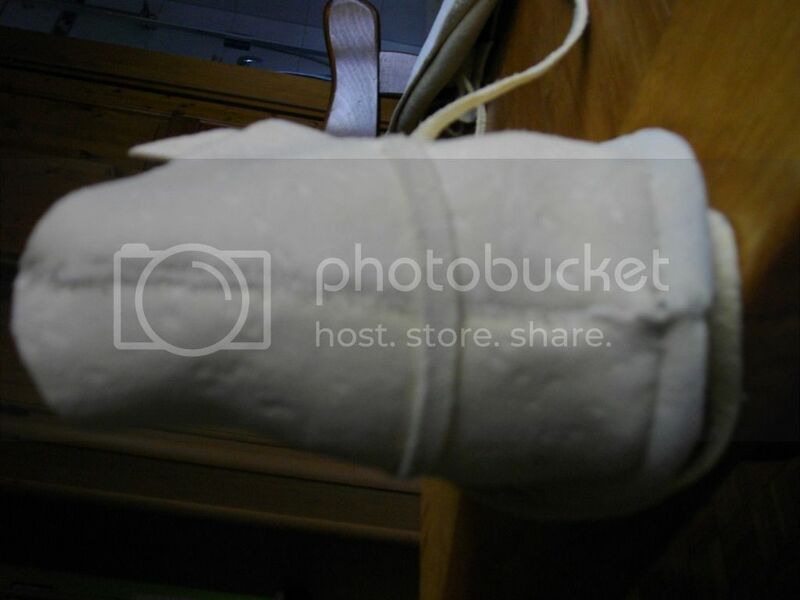 I took a class at UNM on mocc making, to learn how to make ladies boots, since my people don't make boots. I learned I had stranger feet than the human norm, but I might be average for a female duck, LOL. I have to really point the beadwork into toward my arch, or it looks like I'm headed in two directions at once. If you look at lots of moccs, particularly those that have been worn a while, you'll see how designs are adjusted to accommodate different kinds of feet. [I][COLOR="Blue"][B]About the only pain I get is stabbing my fingers with needles ! Don't forget about mental pain if making larger errors. Very very nice, blue, that is my color and that pattern. 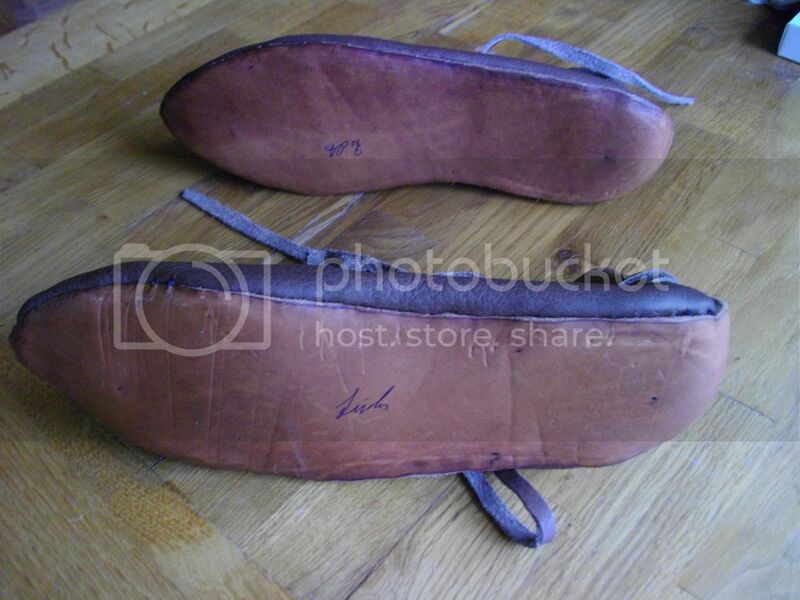 I have first made a pair of turn shoe which are replicas (therefore imitations) of a model used around 800 AC over here. 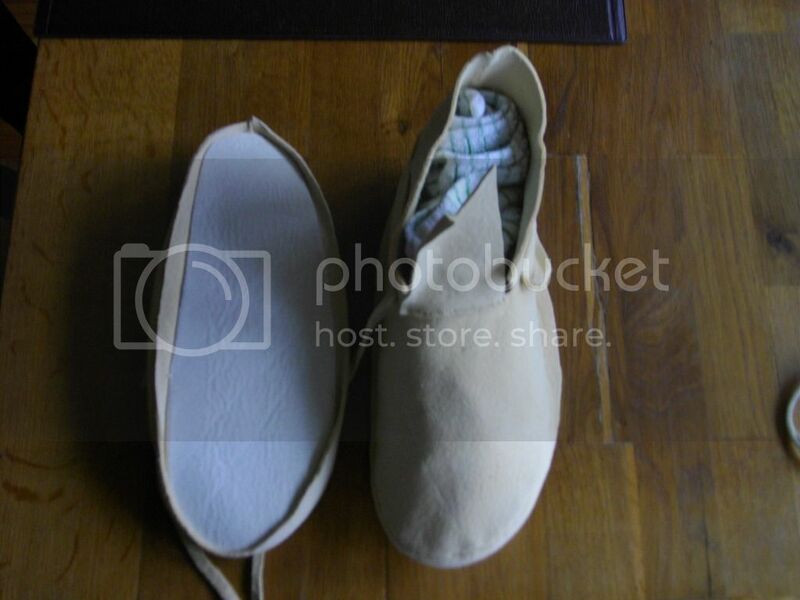 The technique to sew them is very similar to mocassins. Unfortunately on grass or wet stones, they are very slippery. And the soles are used up very fast on today's surfaces. Mocs from Minnetonka are modern Mocs which are very useful in normal days life but they lack the very special of bucksin mocs and the joy, to make them. I started with plain unbeaded mocs and it took some time to get the sole and upper pattern for my feet. The first pair has a sole which is about 1 inch longer then necessary. On dry and warm summer days, I put them on for bow shooting on the archery ground. It is a grass and wood ground within what little nature we have left in crow city. I have glued heels under the latigo sole. Else they are to fast used up. Nice to wear and they are lightweights. I have another pair with the sole one inch shorter. Fits better. I need to put a second sole on. Unrolled cow sole leather (croupon) would be fine but unrolled is not easy obtained. The rolled is far to stiff. Inevitable, I wanted to make the experience of making beaded mocs. I took the general pattern out of the book mentioned earlier in this thread. That is a black and white sketch. Number of beads to get the pattern smooth and the colors fitting is my choice. I can not recall to have seen that particular pattern within the photos I have seen on the I-Net so far but I would not put my hand into the fire. I have started to sew the first upper to the sole. It could be better. Making good mocs is a craft as well as an art. You need a lot of practice in designing and making good mocs. At this moment, coming up with a design pattern completely out of my own, the art part, is much more difficult than the craft which confronts with difficulties of its own. The stretch of the buckskin above is across the upper small but along from toe to back at least one inch maybe more. The sinew must be tightened else sole and upper are loos. But tightening the sinew I stretch the upper. Part of what you have to remember when beading moccs is that the human foot isn't flat. You need to adjust the placement of the design. I know that. I always must try both shoes when commercially made. 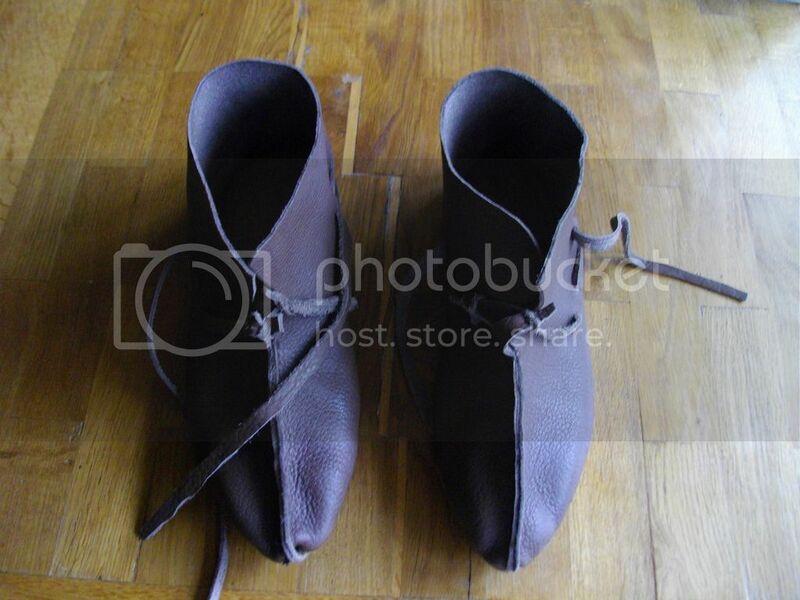 I have shoes in the size 42 (9 US), 43 (10 US) and 44 (10.5 US) of the same make out of different years.Ok, Italian made. The live on a smaller feet in later years. Welcome to the illogical behavior of the gadgets of the 21th century. Ah yes I see mine that you did for me! I get a lot of compliments on them all the time!! OMG, no wonder my mocs turn out crooked! !